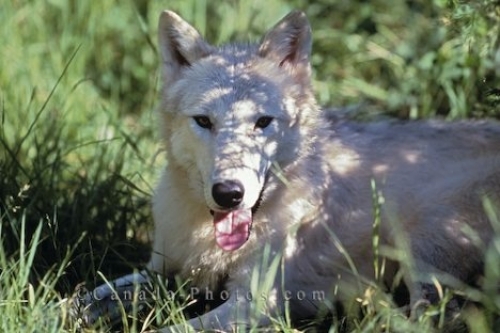 The white fur of this Arctic Wolf is not very good camouflage in the summer months in Alaska, USA. This beautiful white colored animal known as an Arctic Wolf cools off under a tree to get out of the summer sun in Alaska, USA. The Arctic Wolf can survive and handle the extremely cold Arctic winters which it prefers to some of the long, warm afternoons that Alaska receives in the summer. Picture of an Arctic Wolf showing off his beautiful white coat of fur as he rests in the shade of a tree in Alaska.